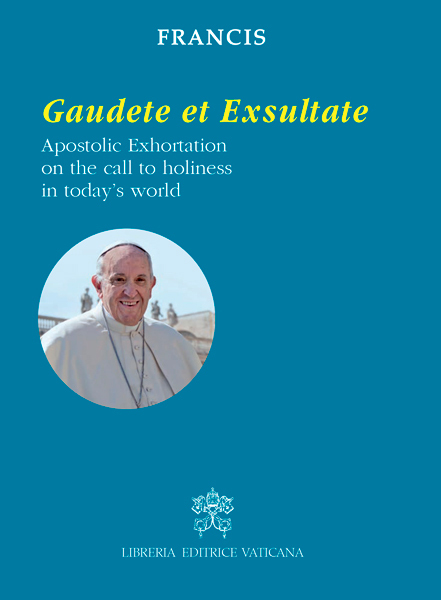 VATICAN CITY (CNS) -- Pope Francis' new document, "Gaudete et Exsultate," shows that holiness is not an impossible task nor is it something to be pursued far removed from today's world, said the papal vicar for the Diocese of Rome. "The pope wants to tell us that holiness is not something else apart from our everyday life, but it is exactly our ordinary existence lived in an extraordinary way," said Archbishop Angelo De Donatis, the papal vicar. The archbishop was one of several guests invited to attend a Vatican news conference April 9 for the presentation of Pope Francis' new apostolic exhortation on the call to holiness in today's world, titled in English, "Rejoice and Be Glad." Many people in today's secularized world may think holiness is "antiquated," but the new document seeks to demonstrate its timeless relevance for everyone, the archbishop said. "To be Christians means to receive from God the gift of a beautiful life, a life rich in meaning and flavor," he said. Deacon Adam Hincks, a Canadian Jesuit continuing his theological studies for the priesthood in Rome, told Catholic News Service that some features of Ignatian spirituality -- referring to St. Ignatius, the Jesuit founder -- shine through in the document. "For example, there's the idea of being contemplatives in action, which is very Jesuit, finding God in the midst of your daily life, making your daily activity a place of sanctification," he said, as well as a call to do a "daily examen" to reflect at the end of each day to see "where was God and how did I respond?" "It's something that's very simple that any Christian can do and that really helps you to grow in holiness," he said. Hincks, who is an astrophysicist specializing in the history of the universe, said he finds "Gaudete et Exsultate" to be "very inspiring because this isn't just for people wearing a collar or a habit, it's for scientists, too, it's for people who are doing whatever job, anyone can be holy" by doing what they do with love: love for the truth, for God and one's neighbor. Sister Josepha, a sister of the Monastic Fraternity of Jerusalem, told CNS that the document seeks to show people holiness is attainable and satisfies that hunger many people, especially young people, feel "to live a relevant life, to give themselves, to improve the world." She said the document says, "Go on! You can. You will! Start today with the small things around you. Holiness is not perfection," but building the kingdom of God with joy and in communion with others. Mohammad Jawad Haidari, a Muslim and ethnic Hazara who fled from Afghanistan because of violent persecution and discrimination against this minority group, said holiness is common to both Muslims and Christians. Holiness is "as a path toward God" with saints and prophets acting as signposts indicating the right way for the faithful to go, said Haidari, who earned a master's degree in religion and cultural mediation while in Rome. The pope's document, he said, shows people that the path toward holiness is wide -- meant for all people to journey, not just scholars or clerics. "I like to contemplate the holiness present in the patience of God's people: in those parents who raise their children with immense love, in those men and women who work hard to support their families, in the sick, in elderly religious who never lose their smile." "Holiness is the most attractive face of the church." "The important thing is that each believer discern his or her own path, that they bring out the very best of themselves, the most personal gifts that God has placed in their hearts, rather than hopelessly trying to imitate something not meant for them." "In times when women tended to be most ignored or overlooked, the Holy Spirit raised up saints whose attractiveness produced new spiritual vigor and important reforms in the church." "We are frequently tempted to think that holiness is only for those who can withdraw from ordinary affairs to spend much time in prayer. That is not the case." "We are all called to be holy by living our lives with love and by bearing witness in everything we do, wherever we find ourselves." "This holiness to which the Lord calls you will grow through small gestures." "Do not be afraid of holiness. It will take away none of your energy, vitality or joy." "Thanks be to God, throughout the history of the church it has always been clear that a person's perfection is measured not by the information or knowledge they possess, but by the depth of their charity." "Jesus explained with great simplicity what it means to be holy when he gave us the Beatitudes (Mt 5:3-12; Lk 6:20-23)." "Giving and forgiving means reproducing in our lives some small measure of God's perfection, which gives and forgives superabundantly." 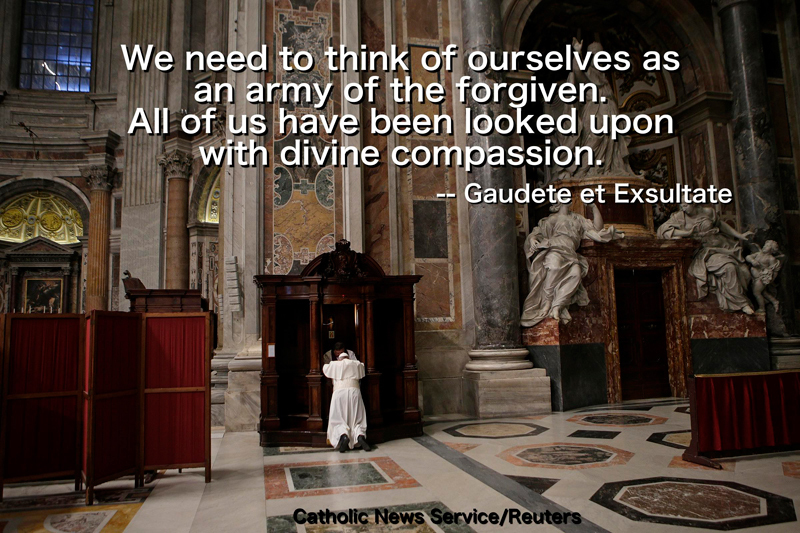 "We need to think of ourselves as an army of the forgiven. All of us have been looked upon with divine compassion." "The saints are not odd and aloof, unbearable because of their vanity, negativity and bitterness. The Apostles of Christ were not like that." "In this call to recognize him in the poor and the suffering, we see revealed the very heart of Christ, his deepest feelings and choices, which every saint seeks to imitate." "It is true that the primacy belongs to our relationship with God, but we cannot forget that the ultimate criterion on which our lives will be judged is what we have done for others." "The saints do not waste energy complaining about the failings of others; they can hold their tongue before the faults of their brothers and sisters and avoid the verbal violence that demeans and mistreats others." "Christian joy is usually accompanied by a sense of humor." "The saints surprise us, they confound us, because by their lives they urge us to abandon a dull and dreary mediocrity." "A community that cherishes the little details of love, whose members care for one another and create an open and evangelizing environment, is a place where the risen Lord is present, sanctifying it in accordance with the Father's plan." "I do not believe in holiness without prayer, even though that prayer need not be lengthy or involve intense emotions." "The devil does not need to possess us. He poisons us with the venom of hatred, desolation, envy and vice. When we let down our guard, he takes advantage of it to destroy our lives, our families and our communities." "Discernment is not about discovering what more we can get out of this life, but about recognizing how we can better accomplish the mission entrusted to us at our baptism." "Let us ask the Holy Spirit to pour out upon us a fervent longing to be saints for God's greater glory, and let us encourage one another in this effort." Click here to read the document on the Vatican's website.